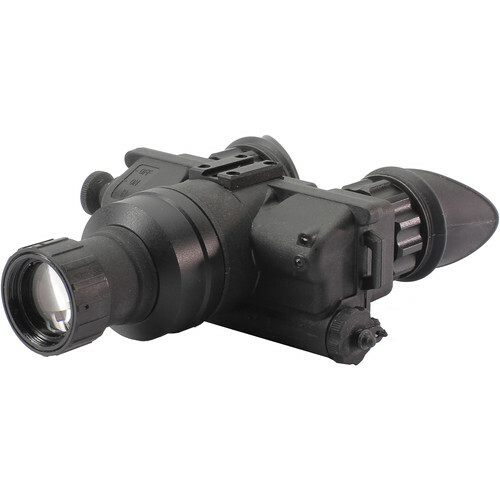 The NVS-7 3rd Gen NVD Bi-ocular from Newcon Optik is a versatile night vision device that can be used with an included headmount, a helmet, or as a handheld device. It features an autogated 3rd generation intensifier tube with GaAs photocathode and resolution of 64 lp/mm. The autogating of the intensifier allows to improve the tube life and resistance to bright light. The optical system features a 27.5mm f/1.23 lens, a 1x magnification, a 40° angular field of view, and a 10" minimum focus. If you are training or conducting a mission in very low light conditions, you can use a built-in infrared illuminator to add brightness to your targets. The rugged and durable construction features a waterproof housing that is submersible to 3' for 30 minutes and endures extensive temperature ranges. Also included with this NVD are two AA batteries, a lens cover, a carrying case, and a lens cleaning kit.